Preach somewhere between commentaries and sermons. Huh? Don’t we read commentaries and preach sermons? Perhaps. Most commentaries are very atomistic. In a sense, they have to be. The writer focuses in on each verse, or sentence, in turn. They try to plumb the depths of lexical, semantic, syntactical and cultural meaning. Once that verse is exhausted they probably deserve a fresh cup of coffee and a break. When they return it’s on to the next verse. Commentators are a real blessing to us and we should be exceedingly grateful for the range and quality of commentaries available (never forget how greatly blessed we are if we can read English since the resources available are so numerous). At the same time, let’s be wary that we don’t just preach a commentary (or a blend of information garnered from several commentators). Our task is not to exhaustively present every detail, neither is it to place historic labels over sections of text, nor to give mini word studies for underlying Greek or Hebrew terms. 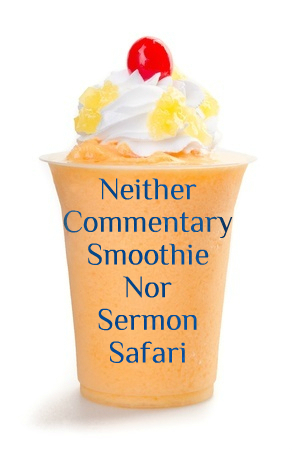 Commentaries are there to help us, but good preaching is not dramatic commentary reading or providing the equivalent of a commentary smoothie. On the other hand, there are many sermons that are anything but atomistic in the way the text is handled. They bounce off a text and range to and fro all over the canon without rhyme or reason, like mining ships exploring the outer reaches of theological possibility. Somehow our preaching needs to fit between these two extremes. We preach a text (or texts), but we need to present them in their context. This means making sense of them in the flow of the book, and appropriately making sense of them in the flow of the Bible as a whole. In effect we need to cut the log both in slice-ward directions, but also in long cuts along the grain. How we balance those and make sense of the passage is part of the science and art of preaching. But somehow that fits between the often necessarily atomistic approach of commentaries and the unnecessarily free movement of many sermons.